There is hope: The survey also found that 84 percent of parents would like to see their children swim more often and 88 percent reported having access to a swimming pool. Most parents said their children can swim, including 78 percent of 7 and 8-year-olds, and 89 percent of 9, 10 and 11-year-olds. Morris discussed the issue as part of a panel with Chris Wiant, Ph.D., chair of the Water Quality and Health Council, and offered tips to parents to help get their children more active this summer. Discussing with your children the health consequences of spending too much time on electronic devices at the expense of more physical pursuits, such as swimming. If children know that sedentary activities have real health impacts, even for children, they may be more motivated to get moving. As part of its award winning summer Healthy Pools awareness initiative, the Council is making free pool test kits available to the public. Additionally, a podcast sharing a discussion with a panel of experts is accessible online. 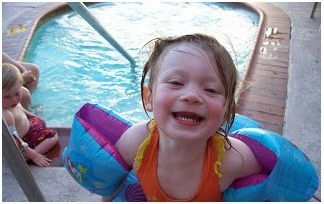 To order a kit or listen in on the discussion, go to www.healthypools.org. “Swimming is not only an all-American way to have fun, swimming is a good form of physical activity. Two-and-a-half hours of water-based (or other forms of) physical activity per week has health benefits across a lifetime,” added Michele Hlavsa, chief of the Centers for Disease Control and Prevention’s Healthy Swimming Program. When asked to prioritize the health benefits of swimming, parents credited swimming with improving children’s cardiovascular health followed by increasing strength and flexibility, developing motor skills, managing weight and managing asthma symptoms. In addition to the 93 percent of parents who are concerned about the health implications of spending too much time on electronic devices instead of swimming, 86 percent are concerned about the impact on children’s social skills. One in four respondents did not know that swimming in a well-maintained pool with a proper chlorine level and pH is a healthy activity for children with asthma. More than half of respondents did not know that a well-maintained pool can reduce the risk of swimming-related ear infections and 23 percent did not know that a well-maintained pool can help reduce the risk of developing diarrhea from waterborne germs. Given a range of choices, more parents chose “the smell of chlorine” as their strongest sensory summertime swimming pool memory but today’s children could be forming more battery-powered summertime memories. To learn more about the Water Quality and Health Council and its efforts to raise awareness of the importance of disinfection for public health, please visit www.waterandhealth.org. The survey was conducted of 1,000 adults with at least one child between the ages of 5 and 14 nationwide. The survey was conducted by telephone, including both landlines and cell phones, from May 2 through May 9, 2013 by Mason-Dixon Polling & Research, Inc. The margin for error on the national results is +/-3.2%. Are you getting enough from your Omega-3s?